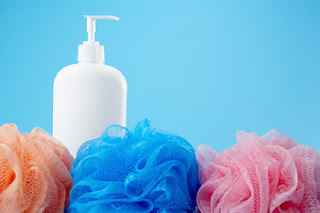 Sodium Laureth Sulfate (also known as SDS) = surfactant (soap) compound. Used as standard soap ingredient in nearly all soaps/shampoos. However it can be quite harsh - I used it at relatively low concentration for a series of experiments. I didn't use gloves cause it isn't "nasty" in the chemical sense. However after a day to touching this stuff all the time the oils in my hands were stripped out and I got dermatitis all over my hands (used gloves after this). So very interested that product has this as number one ingredient. I would have thought that the low allergen products had used another chemical as the soap. Cocamidopropyl Betaine. This is interesting chemical made from coconut oil. It is added to soaps to "reduce irritation purely ionic surfactants cause". In everyday speak this chemical reduces the irritation of SDS (the above chemical). Carbomer thicker / emulsifier the same as PEG-150 Distearate. Parfum = fancy name for perfume / chemical smells good. So in summary I would say the high level of Cocamidopropyl Betaine (CB) is the secret to having a low irritant soap. Would be interested in any feedback on what products people have found to be low allergen and what there ingredients are.